A powerful and robust NAS box that comes pre-configured for limited applications. The success of the modern NAS box can be traced back to the complexities of supporting Windows-based servers 20 years ago. What IT professionals desperately wanted then were turn-key solutions that didn’t require special qualifications to manage, and could be rapidly deployed or repurposed when business requirements changed. From a certain perspective, it was Microsoft that inspired the NAS revolution when it made Windows Server overly complicated to administer. 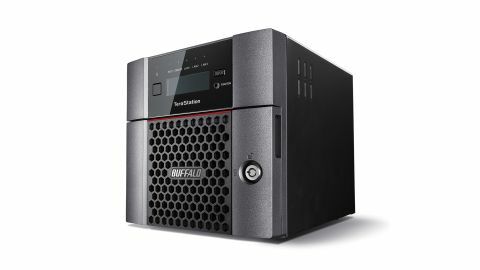 Buffalo’s latest 5010 series TeraStations are the modern descendants of those early NAS solutions. They are sturdy drive enclosures, now endowed with 10GbE network connections and solid state storage. From the outside, there isn’t anything truly special about the TeraStation 5210DF. It’s a solid plastic and metal ensemble, with two lockable drive bays together with a small LED display on the front, and a collection of predictable ports on the rear. These include dual Gigabit Ethernet plus a single 10GbE port, allowing for three independent network connections. In addition to the fan exhaust, on the rear are two USB 3.0 ports, primarily for connecting additional external storage. As with many of these types of devices, it’s decidedly more interesting on the inside. Built around a 1.7GHz Annapurna Labs quad-core AL314 ARM processor, 4GB of DDR3 RAM comes pre-installed, along with two enterprise-class 2.5-inch SSDs. The review model came with two 1TB SSDs installed, making for a total capacity of 2TB if you use them in a RAID 0 (stripe) configuration, or 1TB if you prefer RAID 1 (mirror) for resilience. There is also a dual 256GB version available, with 512GB of potential space. For whatever reason, Buffalo doesn't sell this kit with 512GB, 2TB or 4TB drive options, even if drives of those capacities are widely available. You can’t buy the 5210DF without drives, but you can install your own later. Anyone who has operated a NAS box will accept that having the foundation of effective hardware is important, but for this to be fully exploited requires an extensible software platform. That’s where the 5210DF didn’t live up to our expectations. For the typical IT services manager, the 5210DF ticks a few boxes. It is VMware certified, can sync 10,000 user accounts from an Active Directory, runs RSYNC and supports iSCSI volumes. There is also a degree of cloud support for both Dropbox and Amazon S3. Unfortunately, the S3 support is exclusively for upload and not for synchronizing S3 Cloud storage back to the TeraStation. Those who use Google or Microsoft for cloud storage get no support at all, amazingly. Solving that problem is surely just a matter of installing a third-party Linux app? Right? That possible solution assumes that this NAS box supports user-installable apps, and shockingly it doesn’t. It wasn’t long after we got the review hardware operational that we realized that Buffalo had taken the 5010 Series hardware down a very particular path. A direction that boldly opposes the current consensus of NAS box design where flexibility is king. This device isn’t about creating a general purpose tool, but rather one that is entirely focused on file serving, almost exclusively. These boundaries became glaringly obvious when we accessed the configuration interface via a web browser. The Intuitive Web Management GUI, as Buffalo calls it, bears an uncanny resemblance to the web interfaces that we’ve come to expect from cheap routers, and not a NAS box. For starters, the interface is determined to use a 1024 x 768 portion of the screen, irrespective of what resolution the browser is running. All sub-menus are modal, so you can’t open multiple controls at once. Where other NAS boxes feel like desktop computers to use, this one certainly doesn’t. The deeper we dug into this limited interface, the less this minimalist strategy made sense. For example, USB 3.0 ports support EXT3, XFS or FAT32, but not exFAT. While not documented, it will also work with NTFS drives, but only if you pre-format them. These ports can’t be used to connect a printer, plotter or similar device, but UPS (uninterruptible power supplies) can be attached. There’s no performance tracking, Drupal, WordPress, RADIUS support, and no power management for USB connected storage. The expression ‘throwing the baby out with the bathwater’ seems highly appropriate for the excessive pruning that this operating system has undergone. A few nuggets of functionality that survived include support for Apple Time Machine users, a Failover mode, and NovaBACKUP support. It also masquerades at being a UPnP server, though probably not DLNA compliant, and the manual mentions neither technology. There’s an argument that as the 5210DF’s chief focus is file serving it doesn’t need all these user-friendly features that £100 NAS solutions have out of the box. But this line of thinking assumes this is a NAS box that will never be repurposed.